Real Boats, Kayak Canoe Showroom Gallery. Featuring a select collection of: Handcrafted Real Boats, Kayak Canoe Showroom, lifesize! Model Boats Ships and more Gallery Shop items. Hand crafted Models of nautical decor, ships, boats. Our replicas are handmade from scaled plans, information and links. Real Kayak 17 - 1 Person: [ Dimensions: Length 206 X width 23 X height 13 inches ] This kayak is completely handcrafted and it typically takes about 500 hours to build one. We still use the traditional method of constructions while integrating the highest quality of materials currently available. Strips of cedars are joined together by hand and encapsulated in fiberglass bonded in place with epoxy resin then coated with marine vanish. This combination of fiberglass and epoxy is very strong and completely transparent so that the beauty of the wood will be protected for generations.. This 17 kayak (206 inches) has the following measurements: Length: 206 inches (over 17 feet) Width: 23 inches. Bow Height: 13 inches Cockpit dimension: 31.5x17.5 inches. Weight: About 50 lbs Capacity: up to 550lbs Features- Stunning beautiful clear graded cedar hull - Fiberglass adds important tensile strength and abrasion resistance to the wood - 100% western red cedar make our boats surprisingly light weight that one person can carry - Come with a show graded set of wooden paddles. Real Kayak 19 - 2 Persons: [ Dimensions: Length 229 X width 27 X height 17.5 inches ] This tandem kayak is completely handcrafted and it typically takes about 500 hours to build one. We still use the traditional method of constructions while integrating the highest quality of materials currently available. Strips of cedars are joined together by hand and encapsulated in fiberglass bonded in place with epoxy resin then coated with marine vanish. This combination of fiberglass and epoxy is very strong and completely transparent so that the beauty of the wood will be protected for generations.. This kayak has the following measurements: * Mid Height: 13 (inches) * Bow Height: 17.5 (inches) * Stern Height: 14.5 (inches) * Cockpit: 31.5x18 (inches) * Weight: 70lbs * Capacity: 700lbs Features - Stunning beautiful clear graded cedar hull - Fiberglass adds important tensile strength and abrasion resistance to the wood - 100% western red cedar - Designed for a wide range of uses, comfortable for either a short day trip or long journey. - Good for both beginning and intermediate paddlers. - Come with 2 show graded sets of wooden paddles. 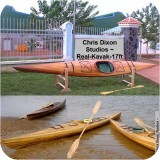 Real Kayak 15: [ Dimensions: Length 177 X width 24 X height 13.5 inches ] This kayak is completely handcrafted and it typically takes about 500 hours to build one. We still use the traditional method of constructions while integrating the highest quality of materials currently available. Strips of cedars are joined together by hand and encapsulated in fiberglass bonded in place with epoxy resin then coated with marine vanish. This combination of fiberglass and epoxy is very strong and completely transparent so that the beauty of the wood will be protected for generations.. This 15 kayak (177in.) has the following measurements: * Bow Height: 10 inches; * Mid Height: 9.5 inches; * Stern Height: 13.5 inches; * Cockpit dimension: 31.5 x 17.75 inches. * Weight: Appr 45lbs. * Capacity: 500 lbs Features - Stunning beautiful clear graded cedar hull - Fiberglass adds important tensile strength and abrasion resistance to the wood - 100% western red cedar make our boats surprisingly light weight that one person can carry - Come with a show graded set of wooden paddles. Real Canoe 16: [ Dimensions: Length 187.5 X width 31.5 X height 24 inches ] This canoe is completely handcrafted and it typically takes about 500 hours to build one. We still use the traditional method of constructions while integrating the highest quality of materials currently available. Strips of cedars are joined together by hand and encapsulated in fiberglass bonded in place with epoxy resin then coated with marine vanish. This combination of fiberglass and epoxy is very strong and completely transparent so that the beauty of the wood will be protected for generations.. This canoe measured as follow: * Length: 187.5 inches * Width (Beam): 31.5 inches * Mid Height: 12 inches * Bow/Stern Height: 24 inches * Weight: Appr. 50lbs * Rocker: Slightly rocked - 4 inches * Capacity: 550lbs Features - Stunning beautiful clear graded cedar hull - Fiberglass adds important tensile strength and abrasion resistance to the wood - 100% western red cedar make our boats surprisingly light weight that one person can carry - Come with a show graded set of wooden paddles. Set Of 2 Canoe Paddles: [ Dimensions: Length 58 X width 7 X height 0 inches ] These are handcrafted canoe paddles made from top graded western red cedar and mahogany. The wood design makes it a really beautiful paddle. Each strip of wood is carefully hand picked to create rich grain on the blade. The entire paddle is sanded over and over again to create a very smooth finish. Its not only beautiful, but also strong that will give you the strokes you need and light weight for less fatigue. Kayak Paddle: [ Dimensions: Length 46.7 X width 7 X height 0 inches ] This is a handcrafted kayak paddle made from top graded western red cedar and mahogany. Each strip of wood is carefully hand picked to create rich grain on the blades. The entire paddle is sanded over and over again to create a very smooth finish. Two paddles are joined using metal reinforcement. They can be turned to create different angles between 2 sides. Its not only beautiful, but also very strong that will give you the strokes you need and light weight for less fatigue. Recommended to put the ships in display cases to not only increase their value but also protect them from dust. Most of these items are imported, so style and price is subject to change and availability may be limited.
. In stock items shipped within 2-4 business days after processed.
. We may ship internationally and Alaska or Hawaii , please contact us for a shipping estimate. All tall ships expert level are fully assembled and packed in an extremely secure wooden crate which is boxed and double box. All models are securely pack with foam sheets, peanuts or bubble wraps. Most of the items are shipped double boxes. Report any damage or defectiveness within 5 days of receipt of shipment. We may replace or refund if no replacement is available. For replacements, you must contact us for instructions and return the model within 7 days. Restocking fees may apply.
. Prices are subject to change.
. Quantity Discounts may apply!